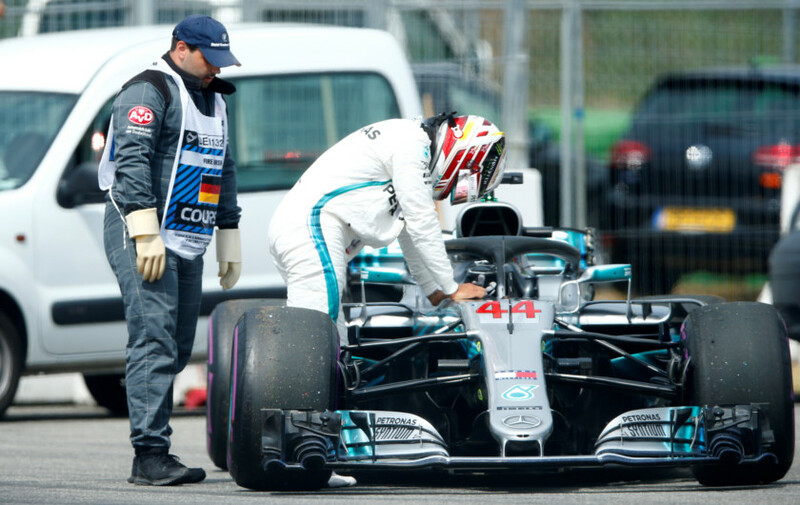 Hockenheim: Lewis Hamilton’s bid for a fifth world title suffered a setback on Saturday when his Mercedes car broke down and forced him to abandon qualifying for the German Grand Prix. After running wide and locking up at Turn Eight, the defending four-time champion lost use of his gearbox and was told by the team to stop to avoid further damage following a hydraulics failure in the first part of Saturday’s hour-long session. He is likely to start Sunday’s race in 14th place or worse, if the team have to replace his gearbox or other parts. The setback is a blow to his hopes of mounting a fightback against home hero Sebastian Vettel of Ferrari in the drivers’ world championship. “It definitely was a tough one but these things happen and all you can do is try and gather your thoughts and live to fight another day, another opportunity to rise, so I’ll give everything tomorrow to see how high I can get up but it’s not going to be like Silverstone,” Hamilton said. To make matters worse for the Briton, his rival Vettel clinched pole position by smashing the track record at Hockenheim that was only set by Max Verstappen in the second practice session on Friday. It looked as though Hamilton’s Mercedes teammate Valtteri Bottas had snatched pole away from the German in the dying seconds of Q3 with the fastest time, but Vettel bettered that time once again to start from first in Sunday’s race. Vettel, who is also bidding for a fifth title, leads Hamilton by eight points.